I’m so excited for this blog post! 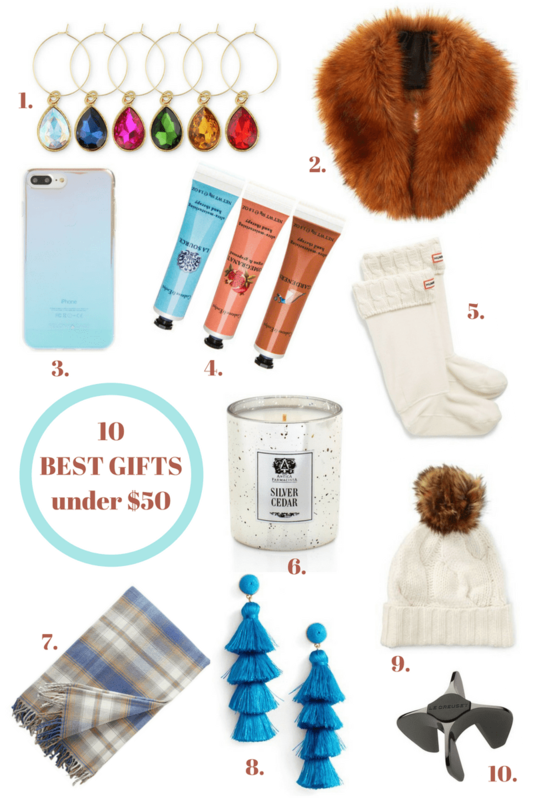 Today, I’m continuing to share my Holiday Gift Guides with the Best Gifts Under $50.00. Some of these items are things that I personally own and absolutely love. Others on this gift guide are things on my lust list, which means that I need to drop some major hints to Kerry. Are you reading this honey? Gift giving should be filled with fun and unexpected surprises! By far, the best gifts are ones that you want – but don’t want to splurge the money on. I’m talking about a fabulous pair of earrings, even though you have one in every color. Or, a new case for your smartphone even though there’s nothing wrong with the one you have been using for two years. It puts a smile on everyone’s face when they get something just because it’s F.U.N. I am always losing these to my kiddos and I bet she is too. Give her a new and glamorous Jewel-Tone Wine Charm Set. Ladies, have you heard? Faux fur collars are all the rage this winter! Wear them around your favorite coat or elevate a sweater. An eye-catching Holographic iPhone Case that’s something like a unicorn. This is a dazzle gift for your friend who likes to be magical. Say buh-buy to dry, cracked hands. The experts at Crabtree & Evelyn have a Classic Hand Therapy Sampler to keep her hands supple this winter. Got Hunters? Cable knit is trending this season, I love these Hunter Cable Knit Cuff Welly Boot Socks. Leave it to Nordstrom’s to carry Antica Farmacista Silver Cedar Mercury Glass Candles. This is a limited edition candle fragrance with notes of cedarwood, sandalwood and rich agarwood complement evergreen notes of black spruce, juniper and Italian cypress. Subtle notes of white amaryllis make up the base, adding floralcy, while a gin note adds a herbal tint. I don’t know what that means, but it sure must smell good. Temperatures are dropping in the Northeast this week. Give her this chic and cozy Pendleton throw to wrap herself up in. I have these Gabriela Tassel Fringe Earrings in several colors. They are super fun and flirty! One size fits all (thank God) of this Ralph Lauren Rope Cable-Knit Pom-Pom Hat. Perfect for this time of year. And last but not least. Tis the season for celebration! For the girl who always has a bottle of chilled bubbly on hand. This nickel-plated champagne opener is a must for her bar. I hope you liked my ideas and got some inspo. Happy Shopping everyone! If you liked this post, please take a moment to “like us back” on Facebook and be sure to follow Connecticut in Style on Instagram. Thank you so much!